This 11-3/4" long dirk showcases crisp etchings of the traditional Scottish foliage and thistle motif on both sides of the blade. A 5" long, swagged false edge and a knurled pattern on the blade back mark this dirk with distinction. 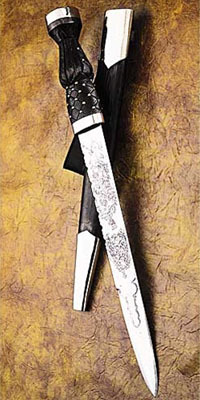 The black wooden handle is carved in an interweave pattern dotted with ornamental nickel silver tacks. The sheath is wood covered with leather and reinforced with metal throat and tip.